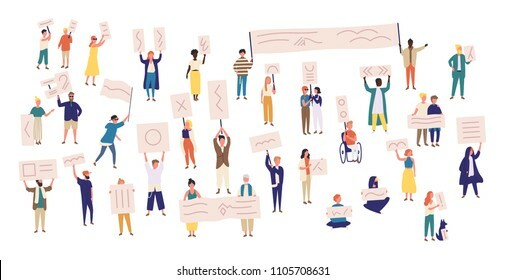 7011 place | Vector illustration in rank M-rank: Crowd of protesting people holding banners and placards. Men and women taking part in political meeting, parade or rally. Group of male and female protesters or activists. Vector illustration. Crowd of protesting people holding banners and placards. Men and women taking part in political meeting, parade or rally. Group of male and female protesters or activists. Vector illustration.